Tezepelumab has received breakthrough therapy designation from the FDA for non-eosinophilic severe asthma. Tezepelumab is a fully human monoclonal antibody that targets thymic stromal lymphopoietin. Increased levels of thymic stromal lymphopoietin are not only associated with asthma2,3 but also atopic dermatitis.4-6 Moreover, preclinical data support the role of thymic stromal lymphopoietin in both asthma2,7,8 and atopic dermatitis,9 indicating that tezepelumab may be an effective treatment. 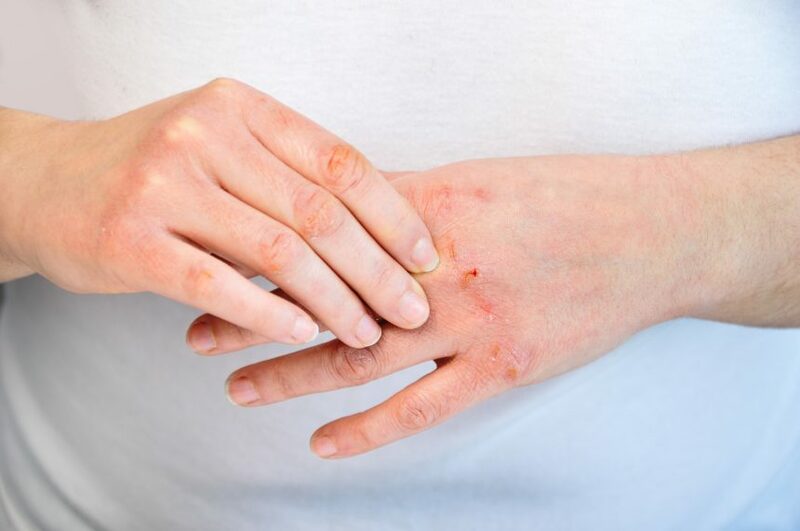 As such, researchers enrolled healthy adults and adults with atopic dermatitis to evaluate the pharmacokinetics, safety, and tolerability of single- and multiple-ascending doses of tezepelumab in 2 double-blind, randomized, placebo-controlled, phase 1 studies (ClinicalTrials.gov identifier: NCT00757042 and NCT00972179). Linear pharmacokinetics were observed for tezepelumab in both atopic dermatitis and healthy participants with a half-life ranging from 19.9 to 25.7 days after an intravenous or subcutaneous administration. The mean area under the curve accumulation ratio after multiple monthly subcutaneous doses was 1.82 for the 35 mg dose, 1.64 for the 105 mg dose, and 1.59 for the 210 mg dose. The mean Cmax accumulation ratio for the 210 mg dose was 1.59 when given every 28 days, 2.84 when given every 14 days, and 6.74 when given every 7 days. Tezepelumab was well tolerated in both studies with no evidence of immunogenicity. A similar rate of adverse events was observed between the tezepelumab and placebo groups. No tezepelumab-related serious adverse events or deaths were reported for any study participants. Disclosure: Amgen provided support for both studies, data analysis, writing, and presentation. All authors were employed by Amgen while the studies were conducted. 2. Ying S, O’Connor B, Ratoff J, et al. Thymic stromal lymphopoietin expression is increased in asthmatic airways and correlates with expression of Th2-attracting chemokines and disease severity. J Immunol. 2005:174(12); 8183-8190. 3. He JQ, Hallstrand TS, Knight D, et al. A thymic stromal lymphopoietin gene variant is associated with asthma and airway hyperresponsiveness. J Allergy Clin Immunol. 2009;124(2): 222-229. 4. Soumelis V, Reche PA, Kanzler H, et al. Human epithelial cells trigger dendritic cell mediated allergic inflammation by producing TSLP. Nat Immunol. 2002;3(7):673-680. 5. Fujisawa T, Fujisawa R, Kato Y, et al. Presence of high contents of thymus and activation-regulated chemokine in platelets and elevated plasma levels of thymus and activation-regulated chemokine and macrophage-derived chemokine in patients with atopic dermatitis. J Allergy Clin Immunol. 2002;110(1):139-146. 6. Hijnen D, De Bruin-Weller M, Oosting B, et al. Serum thymus and activation-regulated chemokine (TARC) and cutaneous T cell- attracting chemokine (CTACK) levels in allergic diseases: TARC and CTACK are disease-specific markers for atopic dermatitis. J Allergy Clin Immunol. 2004;113(2):334-340. 7. Shikotra A, Choy DF, Ohri CM, et al. Increased expression of immunoreactive thymic stromal lymphopoietin in patients with severe asthma. J Allergy Clin Immunol. 2012;129(1):104-111.e1-9. 8. Ying S, O’Connor B, Ratoff J, et al. Expression and cellular provenance of thymic stromal lymphopoietin and chemokines in patients with severe asthma and chronic obstructive pulmonary disease. J Immunol. 2008;181(4):2790-2798. 9. Wilson SR, Thé L, Batia LM, et al. The epithelial cell-derived atopic dermatitis cytokine TSLP activates neurons to induce itch. Cell. 2013;155(2):285-295. 10. Simpson EL, Parnes JR, She D, et al. Tezepelumab, an anti-thymic stromal lymphopoietin monoclonal antibody, in the treatment of moderate to severe atopic dermatitis: A randomized phase 2a clinical trial. J Am Acad Dermatol. 2019;80(4):1013-1021. 11. Corren J, Parnes JR, Wang L, et al. Tezepelumab in adults with uncontrolled asthma. N Engl J Med. 2017;377(10):936-946.